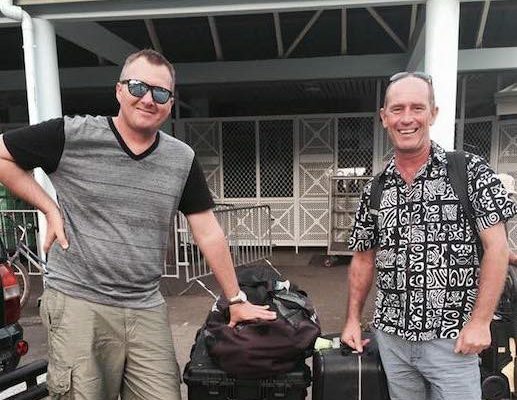 David Jamieson of Superyacht Private Expeditions Fiji and Asia Pacific Superyachts and Rodolphe Holler and his team of Superyacht Private Expeditions recently met to further discuss dive standards for their common yachting clients both in Tahiti and Fiji. The sister companies are aiming at always bringing the best dive services through custom made itineraries and meeting the clients' highest expectations while carefully taking in consideration their dive experience. They also adapt the itineraries to the non-diving guests onboard. The two companies have been successfully working together over the past two years building common synergies and promoting our areas at large. The dive potential among clients definitely increases and the underwater interest has become a huge asset in an owner's decision to bring his / her yacht to the South Pacific as well as drawing many potential charter clients' interest to discover untouched areas while feeling safe and enjoying excellent provisioning. “Fiji is a must see destination in the South Pacific with a dedicated superyacht marina at Port Denarau with nearly all our superyachts coming through Panama into the Pacific and a good percentage continue west to Asia”, reports Jamieson. “I believe that in the future we will see an increase in Superyachts traversing between our two regions of Asia and the Pacific. Asia Pacific Superyachts now bridges these regions with members in all the key destinations. Our team at APS Fiji looks forward to a positive increase in the number of Superyachts traversing our regions and providing services to owners and crew to ensure they receive the very best possible cruising experience”, added the owner. The island paradise of Fiji has long been a well-known destination for those in search of sun and sea in the South Pacific. Famous for its clear waters, soft coral reefs and pristine lagoons - the collection of over 300 islands makes perfect destinations for exploring Superyachts with fantastic dive options. In the past superyacht owners were cruising these waters relatively alone with little infrastructure in place for superyachts and charters. However, with David and the APS team along with the Port Denarau Marina (located on the largest of Fiji’s islands) Fiji is transforming from a cruising destination into a superyacht hub for the SW Pacific region with Port Denarau Marina aiming to be a superyacht destination in its own right.